Nov. 13, 2018 - Bond-funded construction started at Lamar High School in October. This is the last of several projects at Lamar funded by the 2014 Bond program. The other projects, all complete, include the construction of the Multipurpose Activity Center, the new baseball field bleachers and renovated culinary labs. This final project includes a number of lifecycle and deficiency upgrades and improvements. 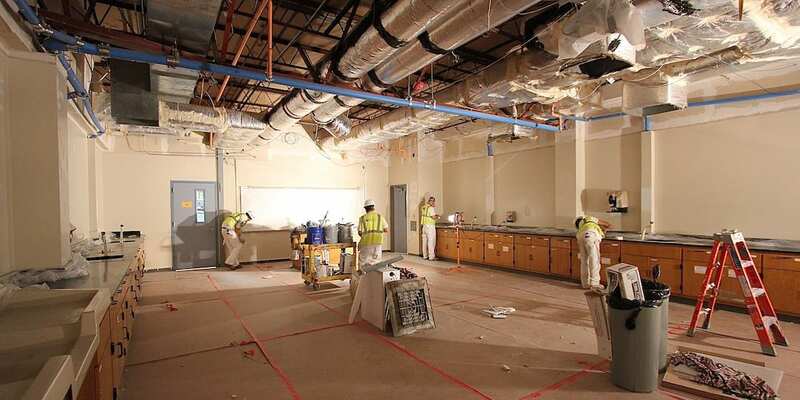 Work is being phased throughout the rest of this year and next summer and started with lab renovations, including ceiling tile, lights and paint. The labs are being renovated in blocks of four rooms at a time. New tile wainscoting is currently being installed in phases in some hallways as well. Over the upcoming holiday breaks, major mechanical and plumbing renovations will start. The overall scope of work includes a number of renovations for fine arts, career tech and athletics spaces. For fine arts, the band hall will receive new carpet, paint and instrument storage. A portion of the library will be renovated to create a computer testing lab, the theater room will receive new flooring, and the auditorium will get new stage rigging, audio system, lighting and large format video projection. The career tech fashion/interior design lab will get a new utility sink. New lockers will be provided for boys and girls tennis and golf, and Gym B will be renovated with new wall-mounted basketball goals, wall pads, key striping and volleyball inserts. Cravens Field will also get some updates at the press boxes, home restroom building and weight room building. A number of other life-cycle and deficiency upgrades will be done throughout the building and grounds. Portions of the north parking lot will be resurfaced, and new LED lighting will be added. Among the planned mechanical improvements are new roof-top HVAC units for the kitchen, band hall and Gym A, and all new electronic controls for the HVAC system. New carpet, ceilings and lighting are planned for a number of rooms, along with electrical, technology and accessibility upgrades throughout the campus.